Royal Arena Copenhagen Beverage Chillers are to be supplied by Kilkenny Cooling Systems later this year. Here at Kilkenny Cooling Systems we are delighted to announce that we have been chosen to design and manufacture bespoke, specialist beverage cooling systems for the brand new Royal Arena in Copenhagen. The state of the art facility has an overall project cost of €134 Million and is due to be completed in late 2016. The Royal Arena will have a capacity of 12,500 for sporting events and up to 15,000 (either sitting or standing) for concerts, making it one of the largest indoor venues in Europe, and the largest in Denmark. For many years, Copenhagen has needed a venue such as Royal Arena, which could attract a large variety of different cultural events and sport events. Copenhagen is one of a few major cities in Europe without such an arena, and now, by building Copenhagen Arena, the Danish capital will be able to compete with other major cities in the region such as Hamburg, Berlin and Stockholm. The cooling requirements for Royal Arena are quite unique and very interesting. The Danish rules regarding the use of refrigerants are some of the most restrictive globally, in order to promote environmental awareness and concerns. Because of this, a standardised ‘off the shelf’ cooling system would not be at all appropriate, and a bespoke solution would have to be designed and engineered to meet the requirements. The company which was tasked with providing the cooling design and installation for the entire Arena, A-Comfort, is a well established and respected name in Danish refrigeration. A-Comfort had already completed several high profile installations in Copehagen before this project, and were ideally placed to offer the same service to Royal Arena. Kilkenny Cooling Systems worked closely with A-Comfort to design a beverage cooling system to meet with the exact requirements of the site. With our 40 years of accumulated knowledge in industrial ice builders and rich heritage at the heart of the Irish draught beer dispense industry (one of the most exacting draught beer markets globally) this task was one which we were suited to! A series of proposals were drawn up and ultimately a design for a centralised high volume cooling system which would accommodate the entire Arena was decided upon. The system consists of two identical beverage cooler / ice builders made entirely from stainless steel. The machines are fitted with patented the Kilkenny jet agitation system and have a large distribution manifold which will allow coolant to be circulated throughout the dispense system across the arena. 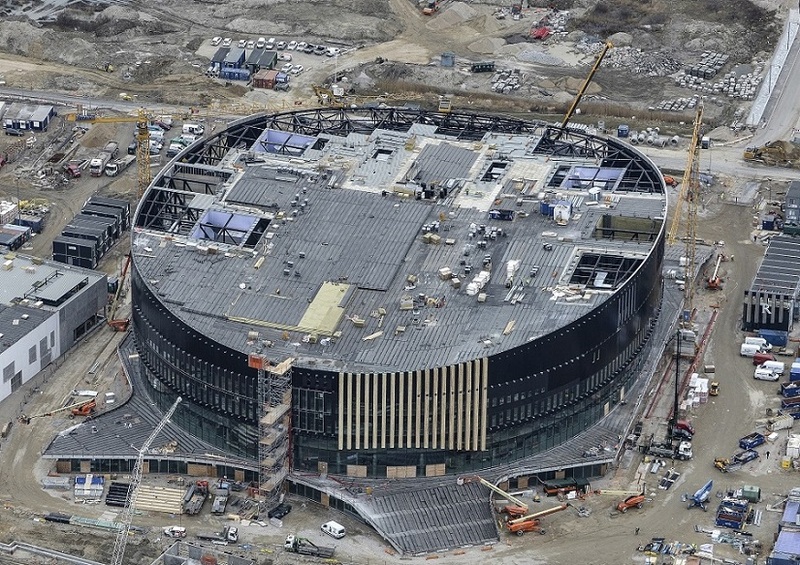 Royal Arena Copenhagen is due for completion in late 2016.